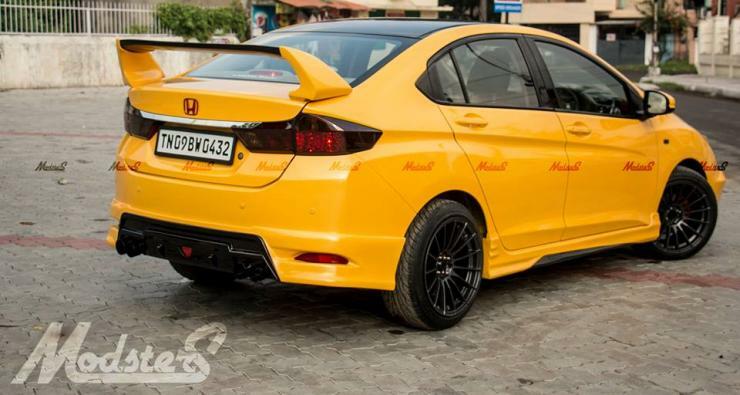 India' HOTTEST modified new Honda City sedan is here! 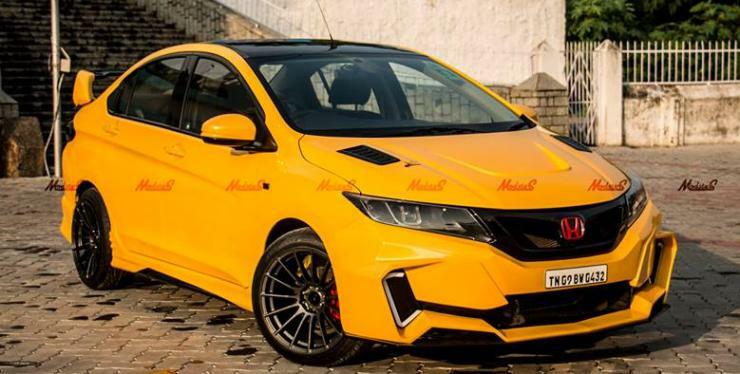 India’ HOTTEST modified new Honda City sedan is here! 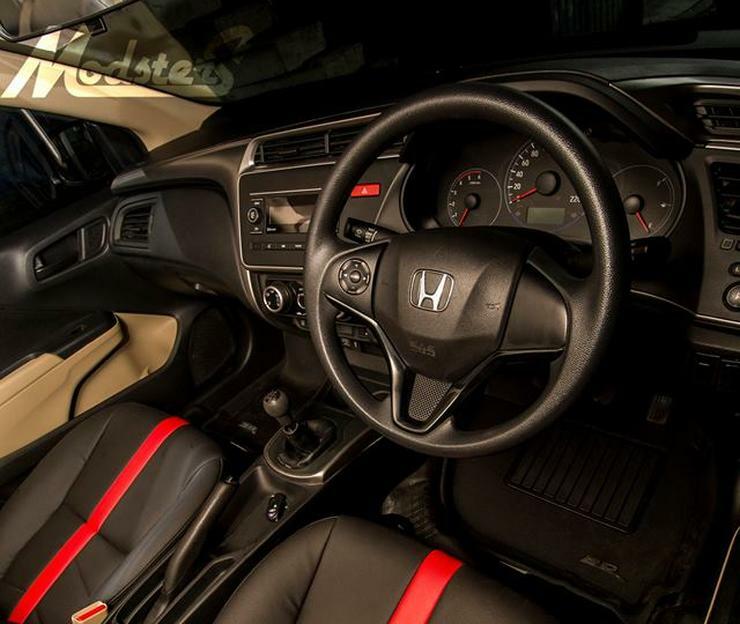 Modsters Automotive of Chennai has given the all-new, 4th generation Honda City a mega makeover, and the result is fabulous. 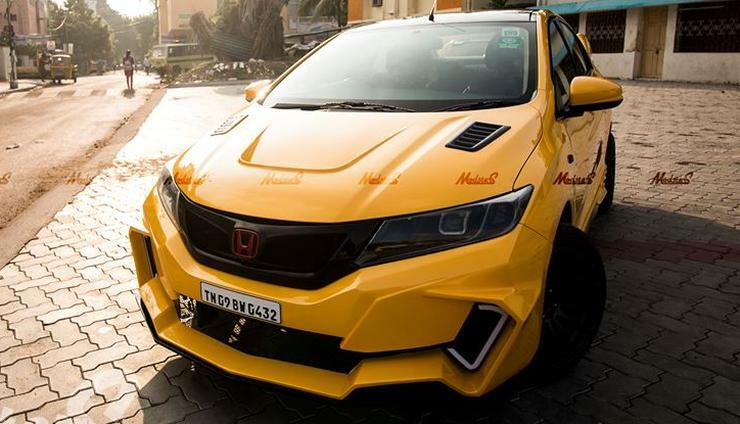 The modified car features a ‘bumblebee’ body kit, making it look all edgy-and-cool, much unlike the current Honda City, which in stock form looks a little-too soft. Then there’s the clever use of colours, in this case a yellow-orange paint job that makes the car look unlike any other City in town. This unique paint shade is what grabs eyeballs, and then the modifications take over. Up front, there’s the sculpted bumper that adds loads of appeal to the front end. The bumper also has integrated LED daytime running lights, providing even more oomph. The grille in a twin bar unit, and is blacked out. A red Honda logo sits amidst the black background, really standing out. The bonnet is re-sculpted, with a couple of scoops added for effect. Alloy wheels are aftermarket items and they’re shod with low profile rubber. There are side skirts running throughout the profile. The black alloys and tyres fill the wheel wells nicely, and the car’s stance is tight and squat. At the rear, the car gets a new bumper, a bumper insert with diffuser that does its bit to lower the stance, a clothes-hanger spoiler, quad exhaust tips, and blacked out lights. The top is finished in a contrast, gloss black shade, and this compliments the profusion of yellow-orange nicely. On the inside, the black theme is carried over to the upholstery and seats, with red highlights added for contrast. The dashboard is left stock, and guess what, this car here is a diesel. Under the hood, the car features an all-aluminium 1.5 liter-4 cylinder turbo diesel engine with 98.6 Bhp-200 Nm on tap. A 6 speed manual gearbox is standard. While there are remaps available to bump up power and torque numbers, it’s unclear as to whether this one’s running any remap.